The help is not up-to-date for 1.1 yet. But it is still useful. Dublin Buster 1.2 has direct in-app access to help information. So this page is no longer maintained. Dublin Buster is very easy to use. A quick look at the following information will help you to use the application quickly and efficiently. Select a bus stop and then touch the location button (the first button at the bottom toolbar) will zoom into that bus stop. Red arrows show in which way the bus is going. Location button: When a bus stop is selected, it will zoom in to the bus stop. When nothing is selected, it will zoom in to user's current location if available. Otherwise, it does nothing. 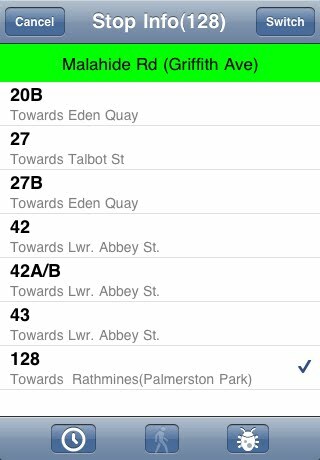 Time table button: Show the time table for a selected bus route. The button on the right top screen allows you to select map type (map, satellite or hybrid). The line thickness of a bus route represents the relative service frequency. The thicker the line, the more frequent the bus route is. 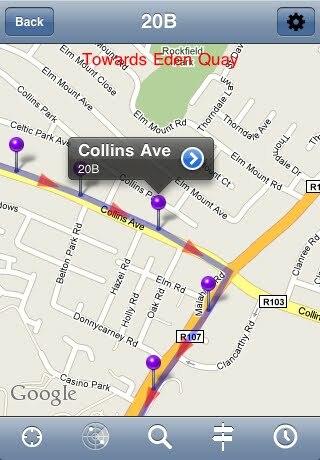 Nearby bus stop view shows you the bus stop close to a location (either map center location or your current location). The green table header show the address or GPS coordinate (if network is not available) of the center location. Each bus stop can have multiple bus routes. Selecting a bus route at a bus stop will bring you to the bus route map view. You can search up to a maximum radius of 2 kilometers. The first search will show the bus stops within 500 meters. The next search will show bus stops within 1 kilometers. The final search will give you the bus stops within 2 kilometers. Bus route view shows all the bus routes available. You can scroll up and down to find a route . 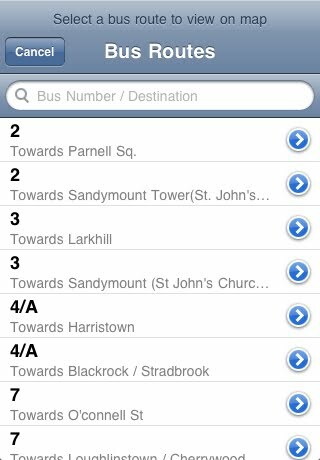 Or you can type a bus number / a bus's destination address in the search bar to find one. When you scroll down the list, the search bar is invisible, you can double tap on the phone's status bar (not shown here) to go to the top of the table. When you tap the disclosure buttion at the right side of a bus, it will show the bus's time table. When you select a bus route, the bus route will be shown on the map. 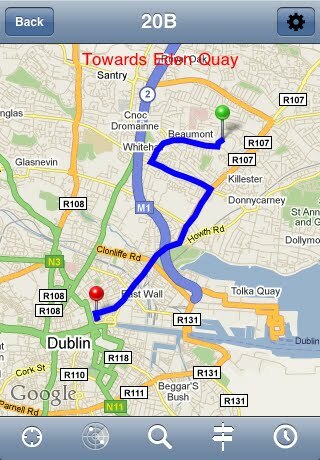 Cancel buttion will go back to the bus route map view without a selected bus. Bus stop view for a route lists all the bus stops for a route. 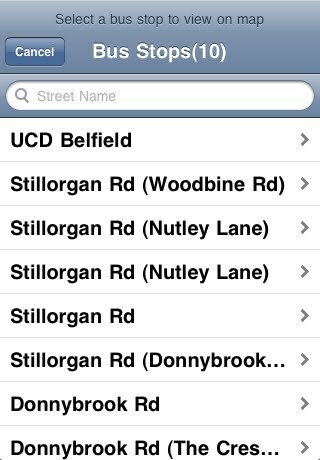 You can do simple search to find a bus stop or just scroll up and down. When the search bar is not visible, double tap on the phone status bar bring you to the search bar at the top of the table. Selecting a bus stop simply bring you to the selected bus stop on the map. Cancel button goes back to the map view. 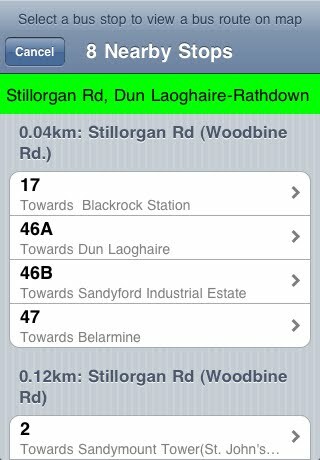 Bus stop info view shows you all the bus routes at the stop. The green table header is the stop's address. You can select a bus route and switch to other bus routes. 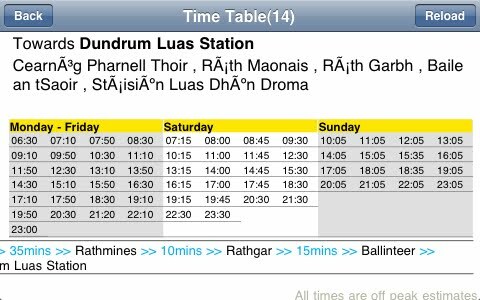 Time table button: show time table for a selected bus route. Walk to the stop button: if your current GPS location is available, it will quit the current application and start iPhone map app to display the walking routes to the bus stop. Time tables are cached locally on iPhone for faster access later on once visited. Reload button refreshes the page from Dublin Bus website. If you find the font of a page is too small to read, you can double tap on the a table column header and iPhone web view will automatically zoom into the column. 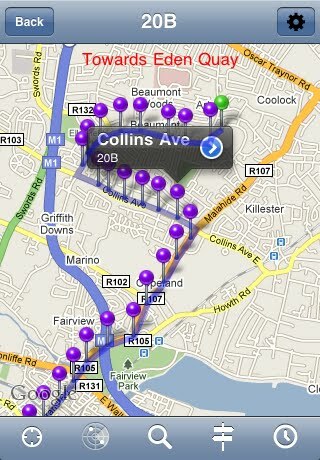 In the follow example, "Towards Dundrum Luas Station" is double tapped. Double tap the same same column will zoom back to the original view.